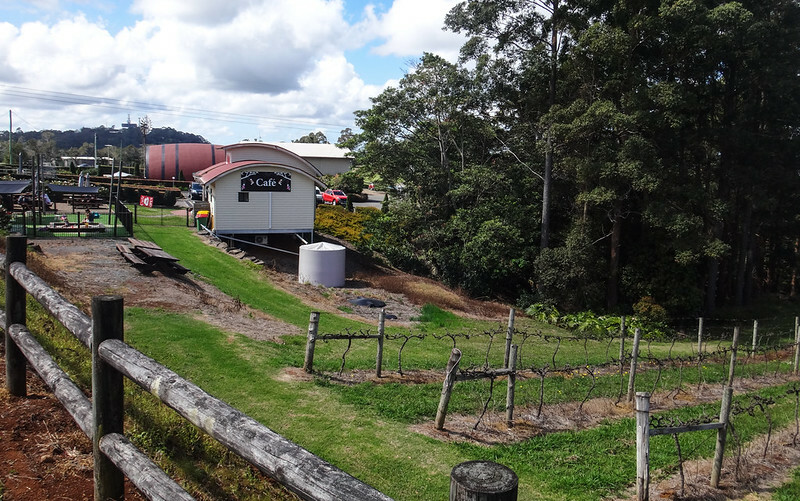 Today’s adventure involved a long train trip, followed by a long scenic walk up a steep hill to Maleny, followed by a hard-earned beer. There were a few challenges I needed to sort out. 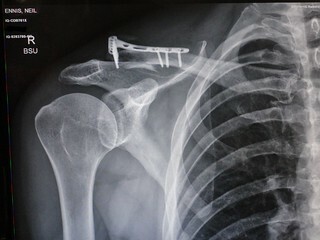 As you can see from the x-rays, my recently broken collar-bone has received a shiny new titanium “upgrade”. This means I can’t ride a bike or drive a car at the moment. So I’ve decided to walk as much as I can instead. The only problem is that long walks require a back pack – which I can’t wear at the moment because the shoulder straps would cause problems with the injury. So I bought myself a wonderful Osprey lumbar pack (see top photo) – otherwise known as a “bum bag” which just straps around my waist. It lets me carry a couple of litres of water plus a few other things, and doesn’t get in the way. 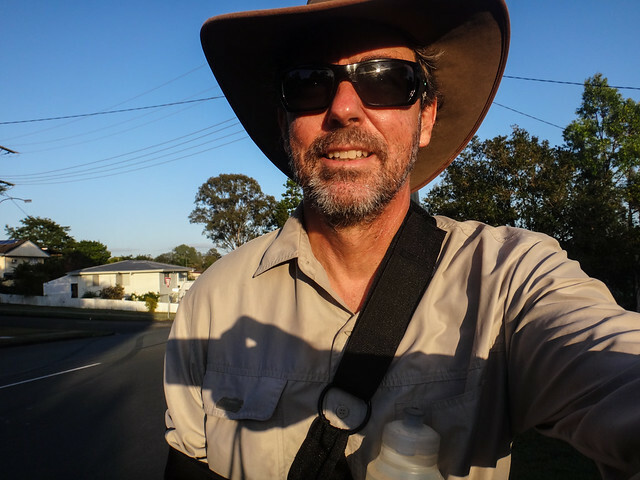 Armed with all my gadgets and looking like a cross between a one-armed bandit and Steve Irwin, I set off from home as the sun was rising. 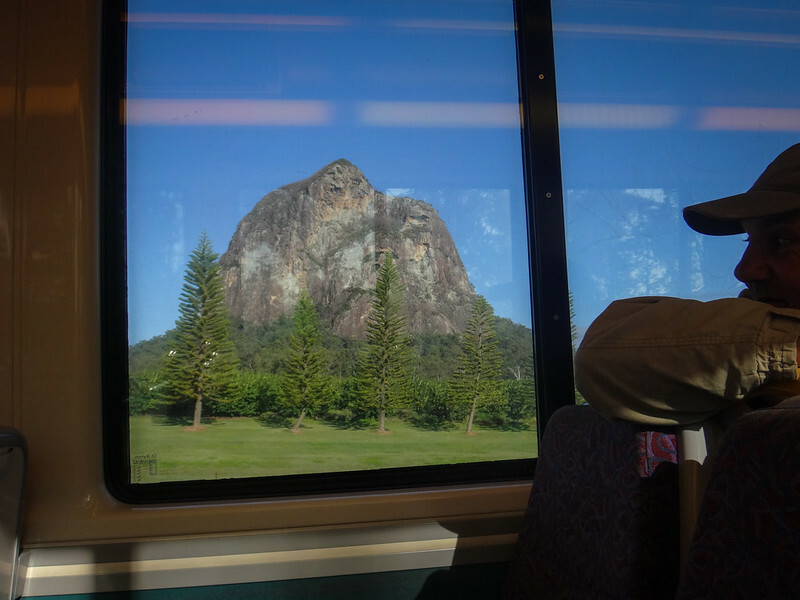 The northward train journey took us through endless pine forests, past the Glasshouse Mountains before dropping me off at Mooloolah an hour later. 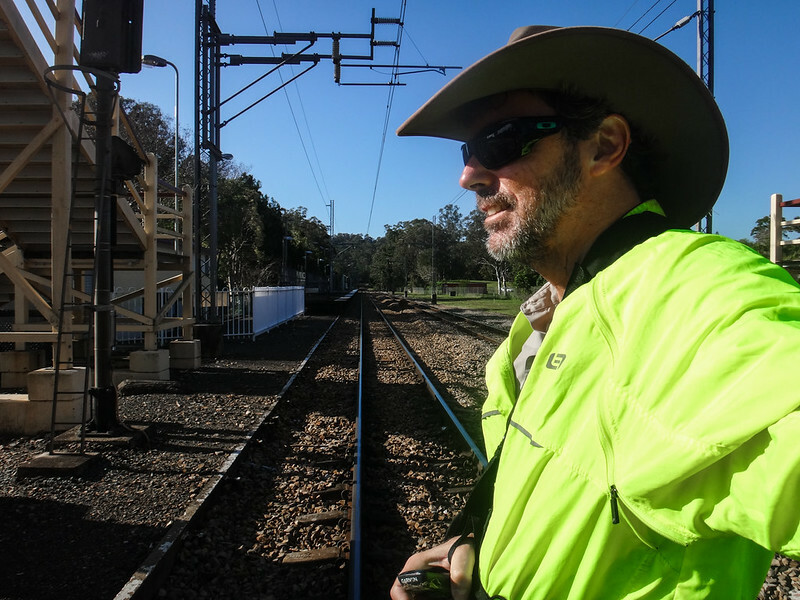 In the past we have ended a few of our rides at Mooloolah Railway Station – it’s in a perfect location near Dullarcha National Park and Ewen Maddock Dam. I was glad to be back! 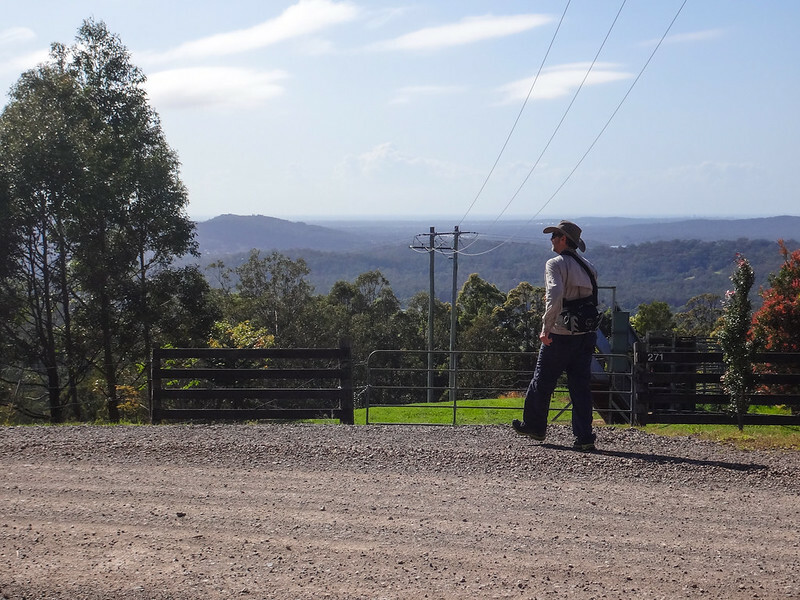 My plan was simple: walk westwards out of town, and just keep going up the hill. 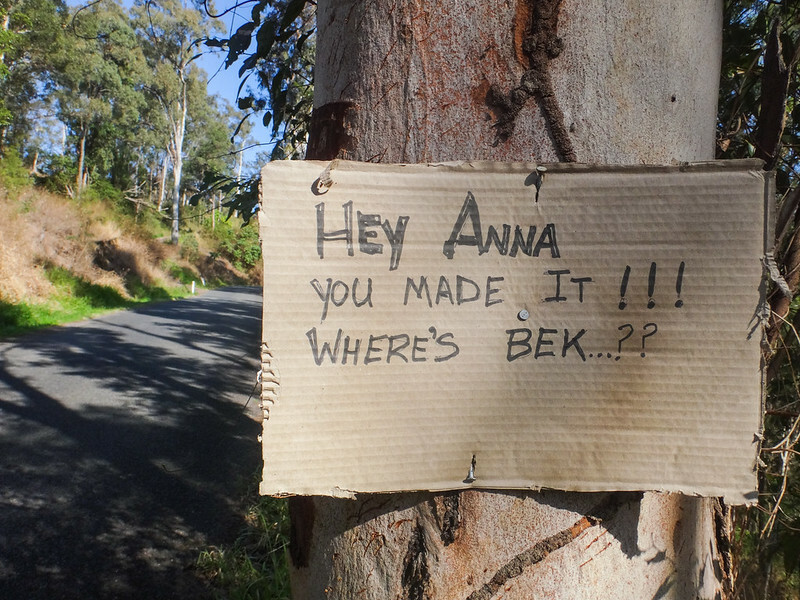 It looks like Anna made it here before me, but Bek wasn’t quite as lucky. Good on ya, Anna! Following a road on foot allows you to see more details. This roadside memorial to “Ces” told the story of a young bloke who loved fishing and obviously had a fatal accident on this corner. 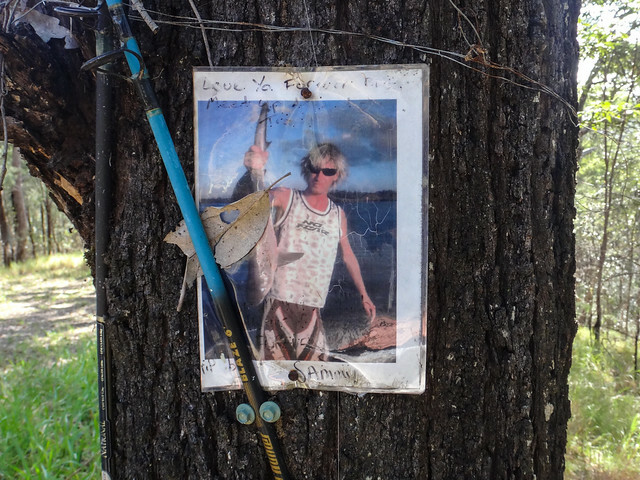 Ces’s fishing rod was attached to the tree, as well as a bottle of “Pure Blonde” beer. I thought about the brevity of our lives, and how important it is to focus on the important things before it’s too late. That’s an awesome looking fish you caught, Ces. 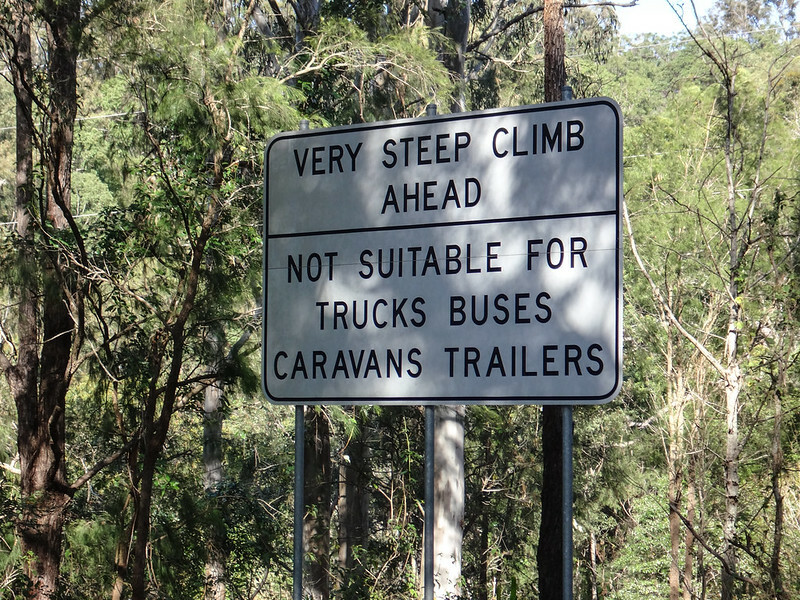 And then the road got steep. The views slowly improved as I climbed the dirt road. 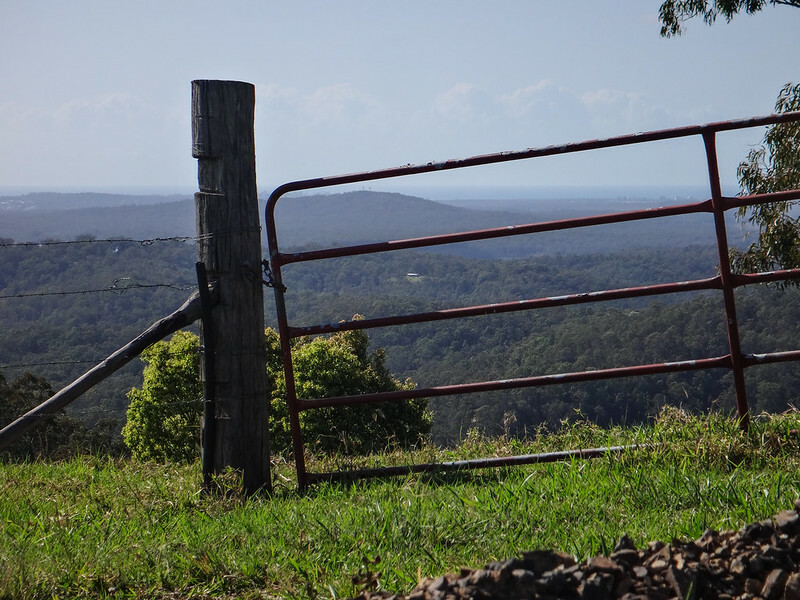 I could see out across the pine forests to Moreton Bay. Wonderful. When I see views like this, that voice soon grows silent. 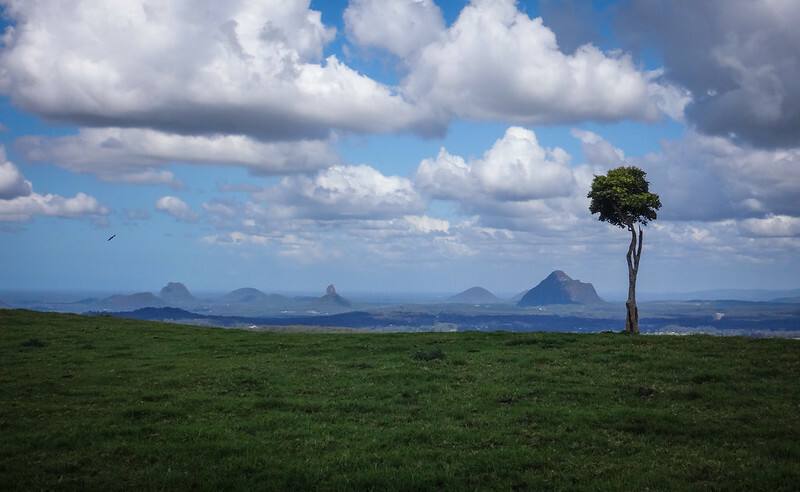 Brandenburg Road followed a ridge line up towards Bald Knob. I was able to enjoy views down the hill on both sides of the road. My mate Darb has ridden down this road. However, I think it would be difficult riding a bike up it – you’d probably have to get off and push in parts. But when you’re on foot, you can’t get off and push – you just have to keep on trudging upwards. Eventually I decided to sit on a flat bit of grass by the side of the road, tore open a gel, and had a bit of a rest. I sang parts of “Climb Ev’ry Mountain” from “The Sound of Music” as I walked upwards. It was probably a good thing no one was there to hear me. The analyst in my head took great delight in pointing out that it sounded like the melody started on the sixth note in the scale. It’s hilarious what goes on in my head when my body is working hard. 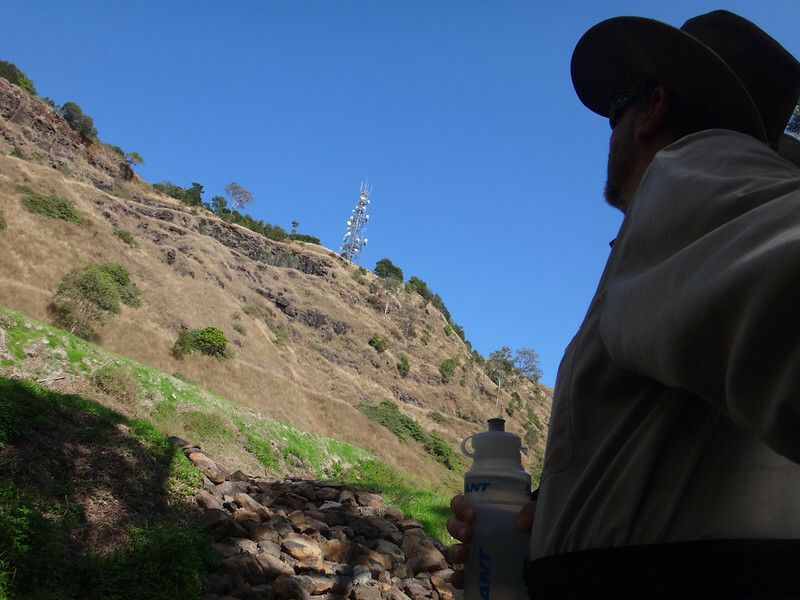 Eventually I reached the top of the road, coming out directly underneath Bald Knob, topped with radio towers. A kind lady in a taxi drove past me. I think she felt pity for a crazy bloke with an arm in a sling. She made a few notes on her pad, then drove off with a bemused look on her face. 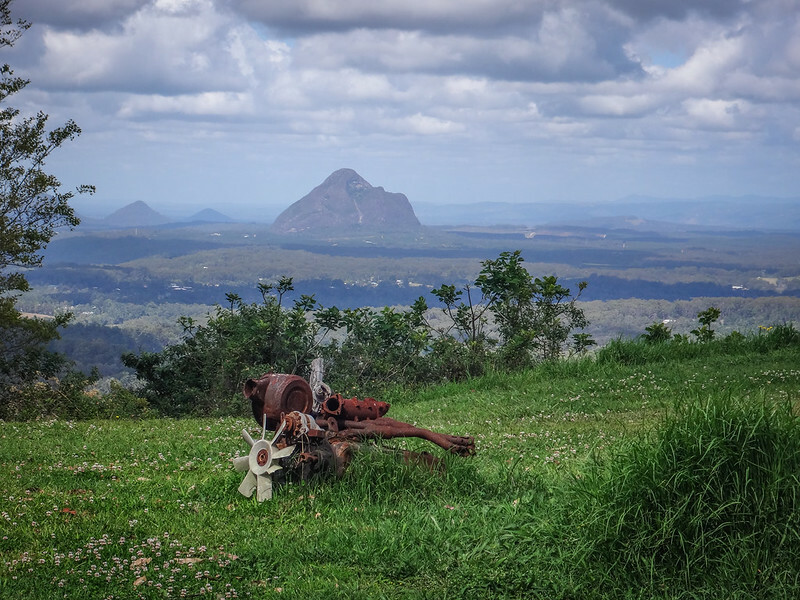 … but the view of the Glasshouse Mountains on the other side of the road was quite impressive. The kind people at Cafe De Fudge refilled my water bottles for me. I’d been walking for almost two and a half hours and was grateful for this cute little cafe on the edge of a vineyard. At Mountain View Road I had to make a choice. 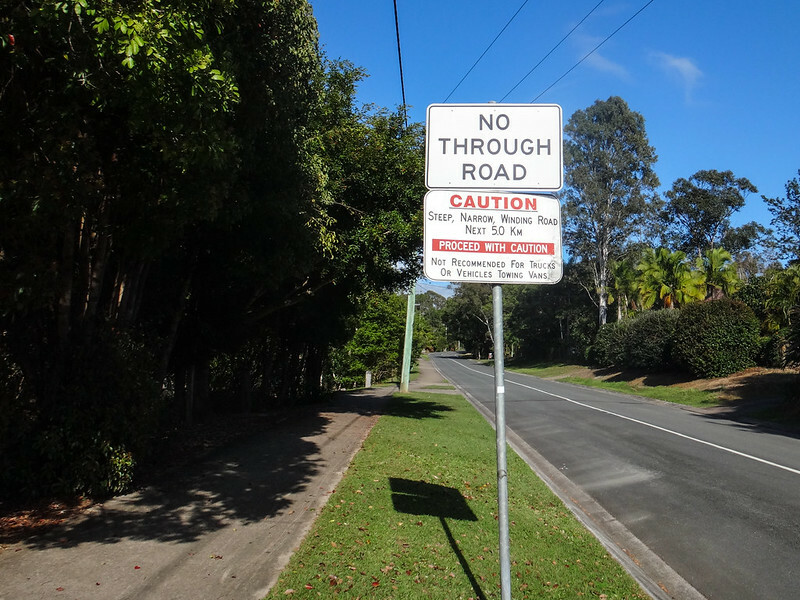 My planned route would take me along this busy road into Maleny in just over an hour. 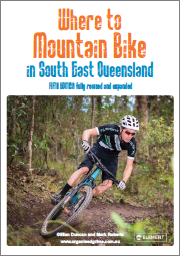 Or I could change the course and take a scenic detour via Mary Cairncross Park. 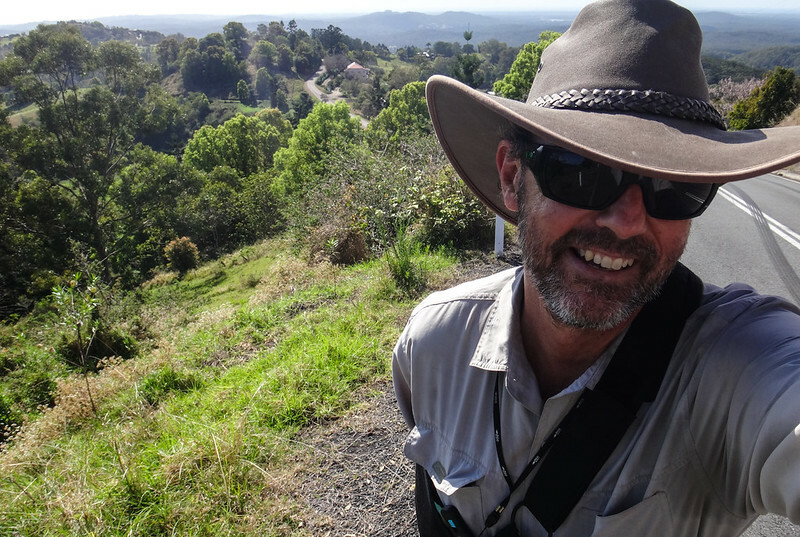 Mary Cairncross Park won out, thank goodness. What a beautiful patch of rainforest! 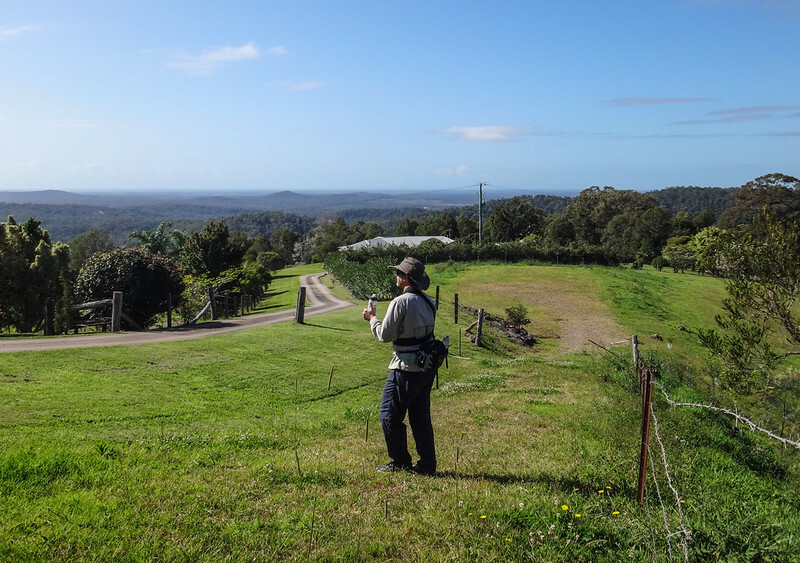 Before settlement, these hills were covered in forest like this, with towering Red Cedars, tangled strangler figs, groves of Piccabean Palms, and a chorus of birds. 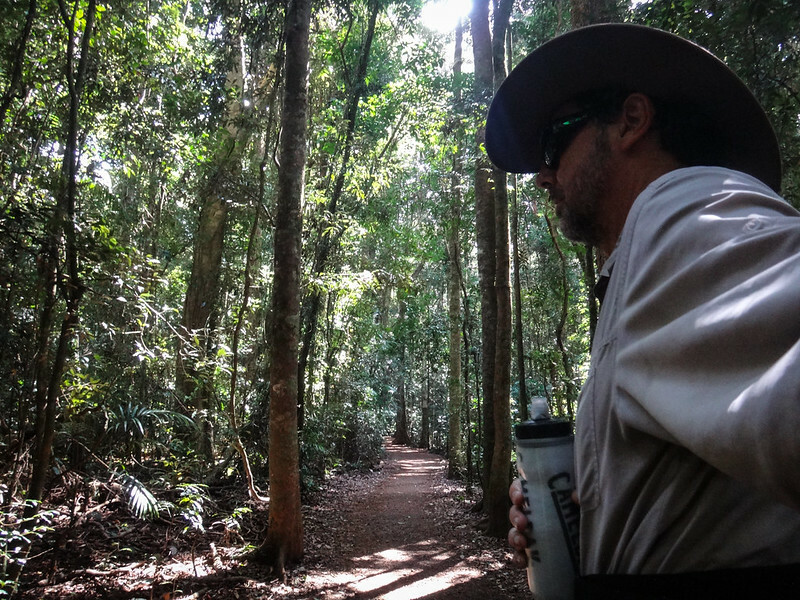 Walking through an ancient forest like this is a peaceful experience tinged with grief – when I think about how many forests like this we’ve lost. 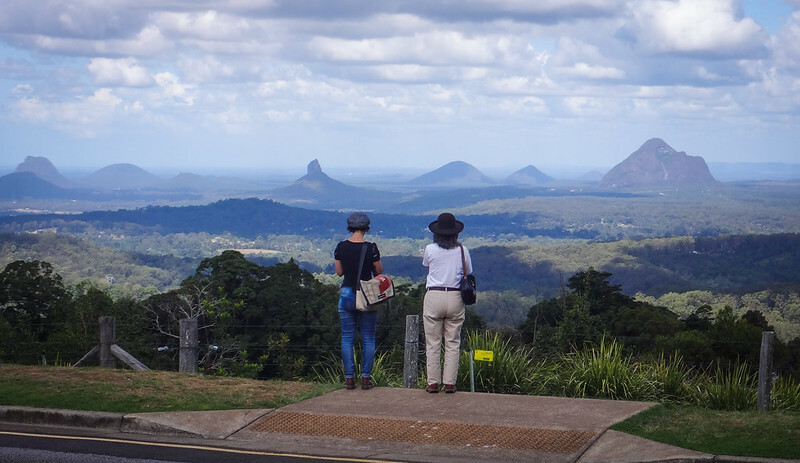 Tourists soaked up the views on the other side of the road as I left the park. It’s not surprising this road was named “Mountain View Road”. 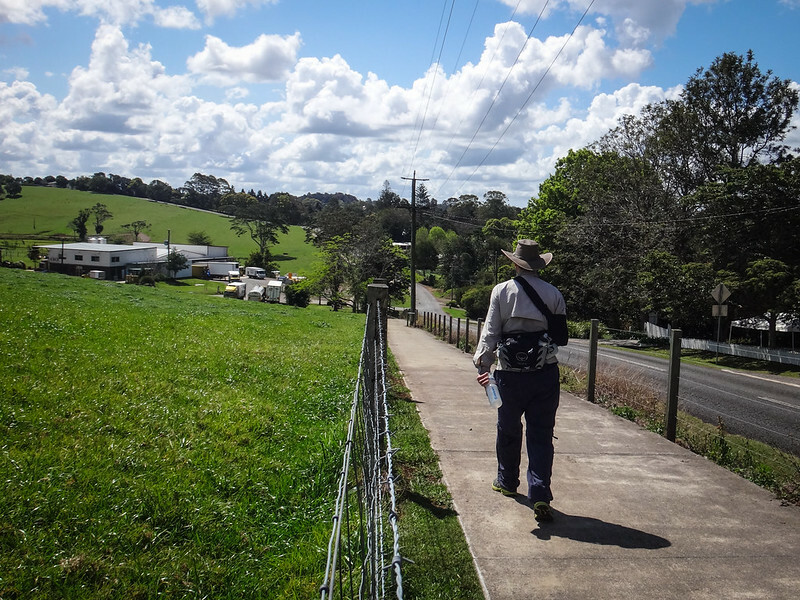 A little further down the road, John was smashing golf balls into his back paddock. “Do you mind if I take your photo?” I asked. John agreed, I counted him down while I held the camera – and this is how it turned out. I’d been walking for almost four hours as I trudged along Mountain View Road. By concentrating on the amazing views I was able to ignore my sore feet. “Not long to go now” I thought to myself as I walked past the dairy. 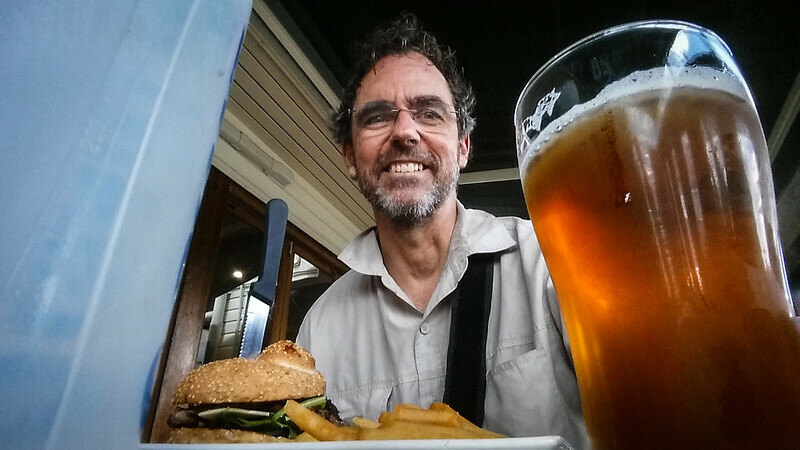 I imagined the cold beer and huge steak I was going to have at the pub. 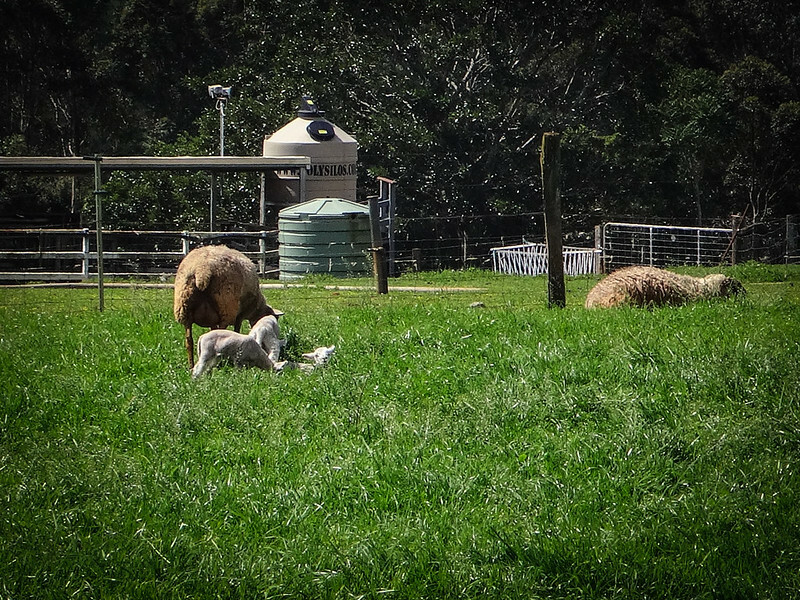 As I neared town, I passed some newborn lambs in the paddock next to the high school. Wouldn’t it be fun going to a school that had their own baby lambs? And there it was. 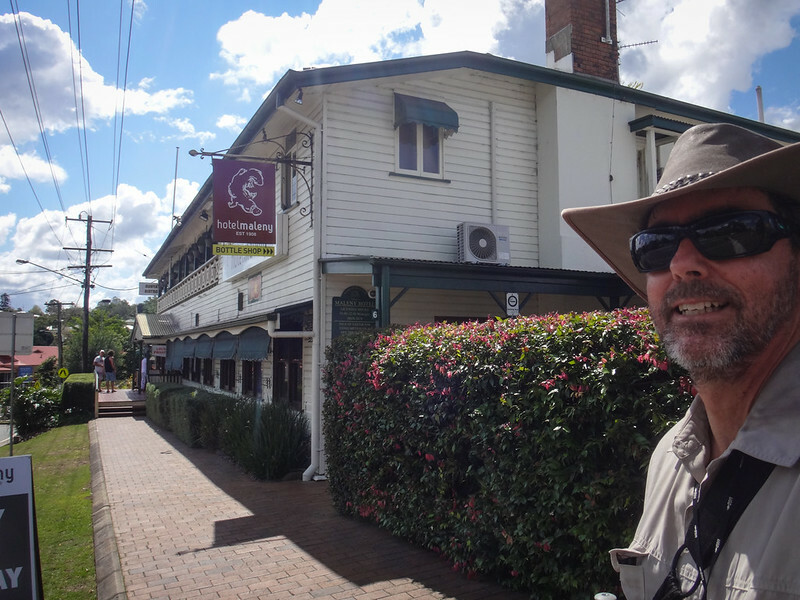 More appealing than the Pearly Gates themselves: the Maleny pub was a welcome sight to this footsore traveller. I think I deserved this one! I walked a total of 18.4km in about four and a half hours. When you add in the walking to and from the railway station at either end of the day, that’s a total of about 24 km for the day. 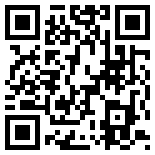 The challenge is rating this on the “tough-o-meter”. I don’t have many walks with which to compare it. 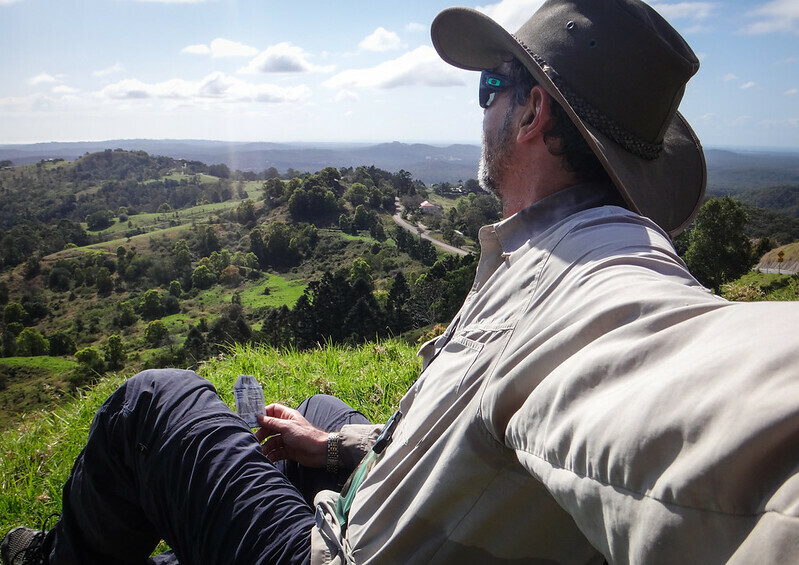 I think it was easier than the Super-V hike I did with Lachlan a few years ago, but harder than the Somerset Lookout walk I did with Liz and the kids a while ago. I only had one or two spots where I was breathing heavily, and I didn’t experience any major discomfort while walking in my jogging shoes. I think 8 out of 10 is a reasonable toughness measure for this one. Don’t do it in summer, and carry lots of water. 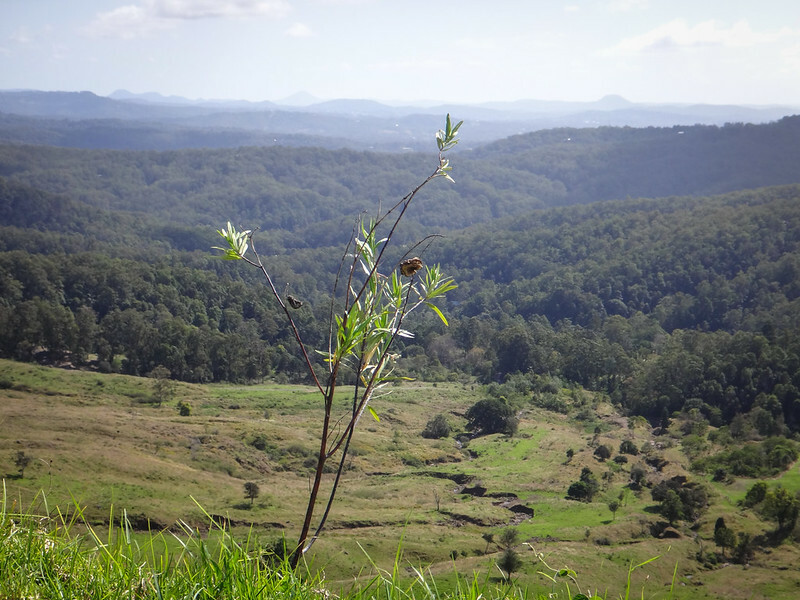 I grew up in Maleny. 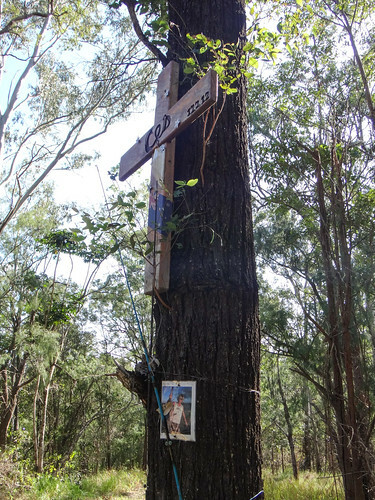 I went to that high school you passed by and went to Mary Cairncross park too many things to remember. I had a bestfriend who lived on Brandenburg road. 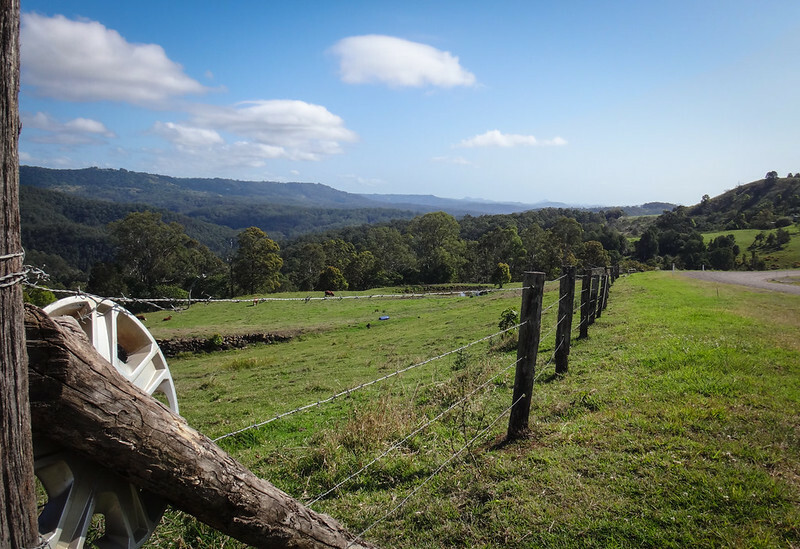 We used to ride our horses down to Moloolah. It used to have large potholes. Is it still dodgy like that? Thank you for posting about a road dear to my heart. Brandenburg Road is nice and smooth now. It’s still unpaved in parts, and very steep in some sections, but you can comfortably take a 2wd sedan down there, so I think a horse would find it quite easy. Nice walk!! geez Neil that distance, that’s the reason God invented horses, mountain bikes, and cars! 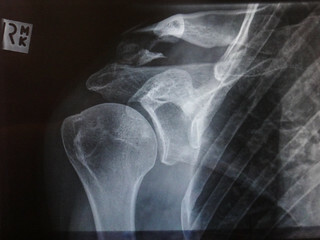 Neat those clavicle repairs. Btw you have a very good looking [R] upper and mid fields. ps Dave’s [flyboy] write up of his Tour Divide was a great serial read. Thoroughly enjoyed it. Btw you have a very good looking [R] upper and mid “lung” fields.